If you use an iPad, I’d like to recommend you download an app that is free today, PDF Forms. It’s normally $9.99. It’s free today, and I think will go back to cost $9.99 tomorrow. The app lets you load and fill out PDF forms. You can then share the forms filled out via e-mail, and you can decide whether to send it as an editable form, or as a ‘flattened’ PDF which is no longer editable. Why would you want a program to fill out PDF forms on your iPad? Obviously, so you can fill out this site’s series of genealogy forms – The B&F Forms System. I’ve tested some of my forms in the program, and it seems to work pretty well. You just put the PDFs you want to edit on either Dropbox or Google Drive, and then connect with the program and it loads them directly. You can edit all the fields on the form, and then save the filled-out form as a separate file, e-mail it (either as an editable form, or flattened), print it, or load it into another program on your iPad that supports PDFs. For those who do not have a genealogy program on their iPad, this is a good way to collect information while visiting relatives, as well as sharing information with people. Even those who do have genealogy programs on their iPad, can still benefit by using the forms as a way to collect information and to share information. 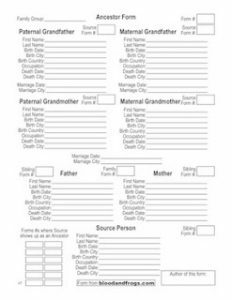 For example, you can fill out a form with the information you know about a particular family, then send it in editable form to someone else and ask them to fill in the blanks. 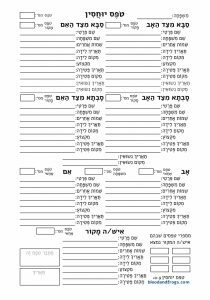 I’m hoping to come out with some updated version of the forms soon, to take advantage of some new form capabilities, to add support for the 1940 census to the census form, and to make it possible to translate the forms into other languages (such as Hebrew). If you have any suggestions for improving the forms, please let me know in the comments below. Hopefully by the summer I’ll have time to update the forms. In the meantime, go download PDF Forms on your iPad and use the current forms and let me know what you think. UPDATE: The app is no longer free, but it seems they’re lowered the price to $8.99.